Galway Irish Crystal Clara 14” Tall Footed Vase. Due to the weight and size, this item ships separately and ONLY by ground freight. Typical delivery is 5 - 7 days. 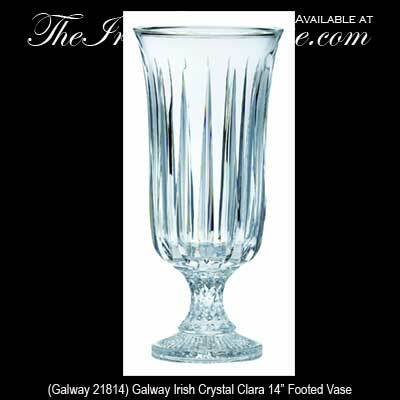 Galway Irish Crystal Clara 14” Footed Vase. 14" Tall, 24% Leaded Irish Crystal. Gift Boxed, From Galway, Ireland. From latin origin Clara means light and bright. Apt for this pattern as the fluidity of the cut reveals the lustrous sparkle that makes Clara a joy to behold.